Kids and adults with ADHD or executive functioning struggles have difficulty with memory, planning, organizing, time management, and goal directed persistence. These are all important skills to be successful in school, as well as later in the workplace. 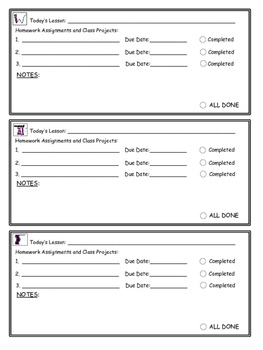 notes each day of the week for each subject. 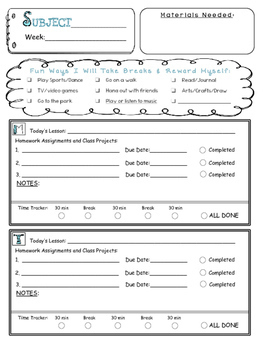 Because taking breaks and rewards are influential to motivation and goal completion, a checklist of fun break ideas are shown at the top of the page. In addition to, alternative weekly planners are also included that display time trackers with homework increments of 10, 15, 20, and 30 minutes, depending on preference. Choose the design you prefer and copy M-F back to back. Print out enough for each subject. 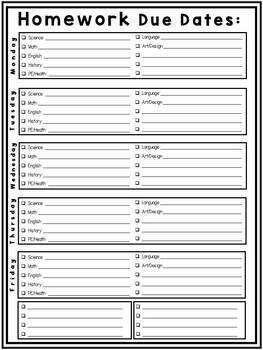 For organization, weekly planner may be placed in a special homework binder all together, or separately in folders by class subject. 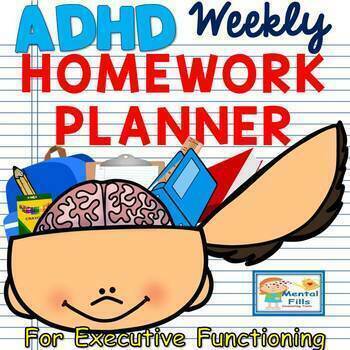 A great addition to this product is "The Goal Planner"
For additional products that address executive functioning, save 20% on the ADHD and Executive Functioning BUNDLE. Copyright © Mental Fills. All rights reserved by author. This product is to be used by the original downloader only. Copying for more than one user is prohibited. This product may not be distributed or displayed digitally for public view. Failure to comply is a copyright infringement and a violation of the Digital Millennium Copyright Act (DMCA). Clipart and elements found in this PDF are copyrighted and cannot be extracted and used outside of this file without permission or license. See product file for clip-art and font credits.